Dilireba's popularity has skyrocketed in recent years as she's been starring in dramas and becoming the face of global endorsements. Like many celebs, she started out doing modelling gigs prior to her debut. 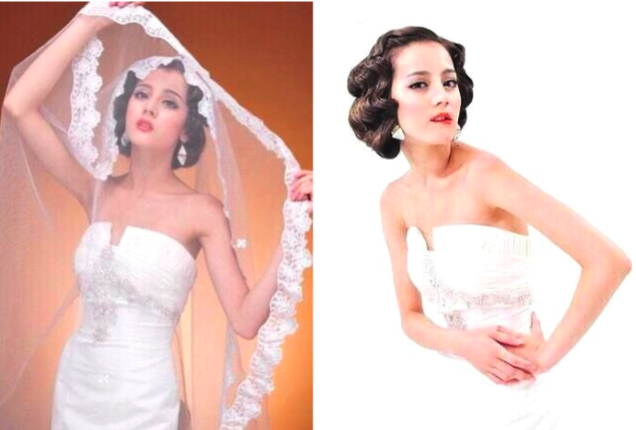 Some of her old photos from a bridal shoot taken many years ago have resurfaced in the internet, and I'm thinking whoever got her to model for them got really lucky. I had to take a second look because of the moustache, but her 'groom' is Merxat Mi Re. We need these two in a drama. Dilireba basically looks the same. I'm not a fan of hr acting but she was definitely a beauty from the beginning. Not like some actresses who buy a whole new face and are unrecognisable in their before pictures. I did not recognise Merxat at all. I still can't believe that is him! She looks different in some of these photo. The third Pic she looks more Chinese. The 4th heavy photoedited. Such beautiful photos, didn't know they are old photos. Dilraba and Mi Re look so good together. I would love to see them in a romance drama one day. Merxat is giving me NIcky Wu vibes in those pics.